Shopping for hotel rates can be tedious. Travelers must select a hotel property before they can see prices other than just the standard default room rate. For those with flexible travel dates, it is nearly impossible to find the best rate for hotel stays beyond the standard room rate. To address the need for more comprehensive search capabilities, Sabre created a shopping cache prototype that allows users to search by both property amenities and room type. 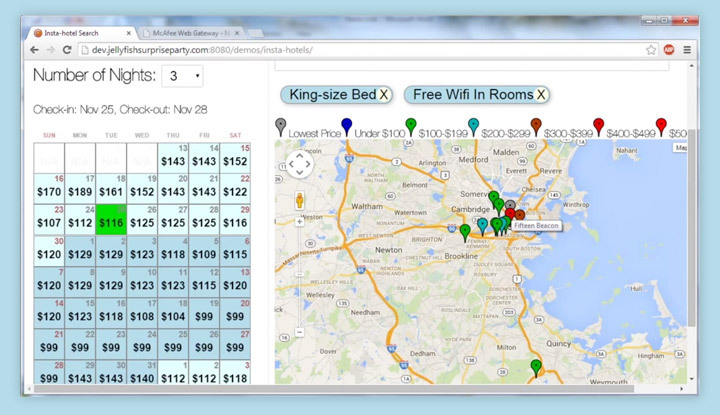 A traveler shops for a five-night-stay in a suite in a Downtown Boston hotel that provides free Wi-Fi. The API returns the lowest rates that satisfy all these conditions for the next 60 check-in dates. A traveler shops for a hotel in Downtown Chicago that is close to Lincoln Park. The user also requests a king-sized bed. The returned rates meet all these criteria.